Wallpaper can be an excellent way to give a room a whole new look. You can choose to paper each wall, or simply focus on one feature wall instead. Wallpaper can be used to add a touch of glamor, a bit of drama, or a bit more interest to a room. In this post, we will go through the best wallpaper tools to invest in and some general tips to get the finish that you want. That’s going to depend on the type of wallpaper. 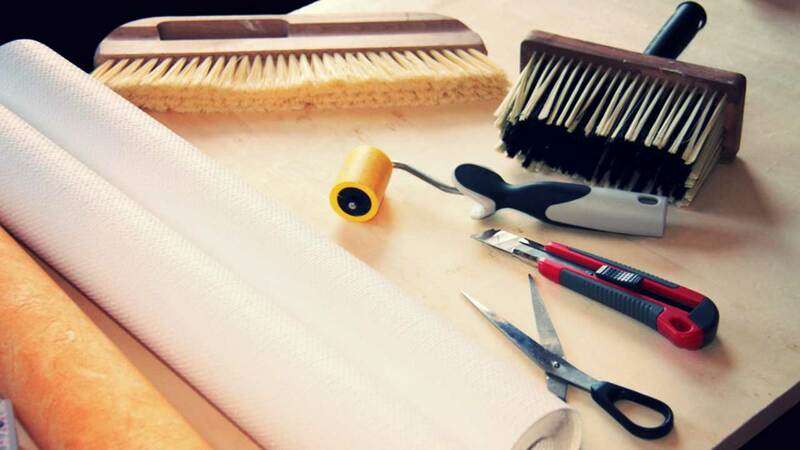 There are basically three types of wallpaper; these are the tools that you’ll need for each. What is a wallpaper brush? There are two brushes used in traditional wallpaper applications. The two look similar, but should not be confused. The first is the paste brush. This is used to apply the paste to the back of the paper so that it can be stuck on the wall. A simple tip is to switch this out for a roller. You’ll probably need to throw out the roller when you’re done because the paste is going to mess it up, but there is nothing better for an even application of paste. Moreover, if you’re a beginner, this pro tip will save you some hassle later. The actual wallpaper brush is meant to be used on the dry surface of the paper. It is brushed over to ensure that the paper properly adheres and that any wrinkles or air bubbles are smoothed out. In some wallpapering supply stores, you’ll be given the option to use a smoother instead. How do you stick wallpaper to the wall? It’s not a difficult concept. You apply the glue, paste the paper to the wall, and then smooth it out. In practice, this will take a bit of trial and error to get right. You’re dealing with long strips of paper, and getting them straight is not always as easy as pros make it look. However, the main issue that most beginners have is in getting the paper to adhere to the wall. It can be quite heavy, so it’s essential to make sure that you get the right consistency with the glue. If you don’t, the paper will slide right off again. We recommend that you read the instructions for the paste carefully before attempting to stick it to the wall. You might even want to check out a YouTube video or two to make sure that you’re getting it exactly right. If you get the paste right, hanging the paper properly is merely a matter of measuring carefully to ensure that it’s lined up correctly, then applying enough adhesive and smoothing it out afterward. Once you get the hang of it, it is pretty painless.